Jeff Green picked up the 62nd last-place finish of his NASCAR XFINITY Series career in Saturday’s Axalta Faster. Tougher. Brighter. 200 at the Phoenix International Raceway when his unsponsored #10 TriStar Motorsports Toyota fell out with a vibration after he completed 3 of the race’s 200 laps. The finish came in Green’s 394th series start and his second last-place run in a row. He now holds a one-finish lead in the LASTCAR standings over Daytona last-placer Dexter Bean and Morgan Shepherd, who was 40th at Atlanta. 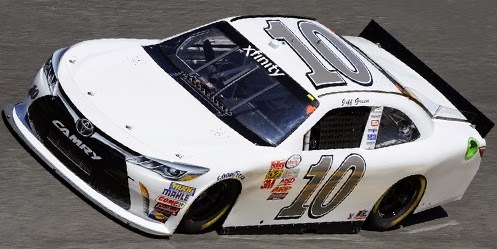 Green returned to the controls of TriStar’s white #10 Toyota, and after sitting out the opening practice along with 3 other drivers, put up the 37th-fastest time of the 41 drivers entered. He put up a lap of 125.462 mph in qualifying and made the field on Owner Points, securing the 36th starting spot in the field of 40. Missing the show was Shepherd, whose #89 was edged for the final starting spot by less than two tenths of a second. That spot went Charles Lewandoski, who got start-up team Kapusta Racing’s #56 Ole Energy Chevrolet into the show in the team’s first-ever attempt. Lewandoski would finish 30th. Three laps into the start of Saturday’s race, Green pulled behind the wall, followed four laps later by the #40 Braille Battery / Grafoid Dodge of owner-driver Derek White. Between qualifying and the race, White traded rides with teammate Carl Long. In qualifying, White secured Long the 39th starting spot in a #13 painted identically to the #46 Al Smith Dodge that Long famously flipped in the final Cup race at Rockingham in 2004. Long came home 32nd. Finishing 38th on Saturday was Mario Gosselin, who this week didn’t enter teammate Dexter Bean’s #92 into the show alongside his #90 King Autosport Chevrolet. 37th went to Landon Cassill, whose #01 G&K Services Chevrolet crashed hard into the Turn 4 wall on Lap 95, bringing out the second caution of the afternoon. The third caution fell for the 36th place finisher, Peyton Sellers, whose engine let go on the backstretch on Lap 124. Sellers had jumped from his NASCAR Whelen All American Series Late Model Stock Car ride in South Boston, Virginia to give owner Victor Obaika his first XFINITY Series start since Atlanta. *This is Green’s fourth last-place finish in a XFINITY Series race at Phoenix. The previous runs came November 2010, March 2012, and November 2013. All four came while driving for TriStar Motorsports. I'll continue to ask, How in the world did Lewandoski make the show & Shepherd didn't? The rules state that if a past champion does not need the 40th starting spot, it goes to the next eligible driver with owner's points. The 89 had points, the 56 did not. NASCAR screwed Morgan, and nobody seems to care. Read somewhere that Morgan was a post entry, and that's why he was not eligible for a provisional. Don't remember seeing the original entry list, so idk if that is true or not. That's the only logical explanation I can think of though. My guess was all the drivers eligible for Owner Points filled the field down to 39th, so 40th went to the fastest car not yet locked-in. If so, Lewandoski was faster than Morgan, so he got the spot. I'm not 100% sure of that, which was why I only mentioned Lewandoski's speed in the article. The initial entry list did have Morgan on it, but I think you have to have your entry in about two weeks ahead of time in order to be considered an "on-time" entry. And yes, Brock, that is how it happens when there are not enough people eligible for provisionals. The only other time I can think of off the top of my head that this has happened was in the 2000 Fall Dover race, when Steve Grissom, Hut Stricklin, and Joe Bessey all had used up their provisionals and they needed to fill the last spot, so they did it via time trials (Obligatory LASTCAR fact: Mike Bliss finished last in that race after getting involved in an accident just 2 laps into the race). Also a slight rant: I think NASCAR needs to go back to limiting provisional use. Otherwise it's just as bad as the locked in rule as far as having teams rest on their laurels and other teams struggling to make races. Interesting fact: had they used the top 30 rule, Shepherd would have quailfied 35th, and Mike Harmon would have DNQ'd.